“Do you remember Dr Rustom Pavri that character from Munnabhai MBBS that helps Munna pass all exams and not get caught by answering questions secretly on mobile?” asked my broker friend Jigneshbhai when we met for coffee this morning. Swami and I had a distinct smile of recognition on our faces, but weren’t quite sure why Jigneshbhai was talking about that comic Parsi character. “My CA friend felt like him yesterday night” he remarked. Swami and I were wondering why. Seeing that, our broker friend clarified. Swami and I then realized that Jigneshbhai was referring to the announcement made by the PM and Govt that 500 and 1000 rupee notes would be illegal tender from midnight of Nov 8-9, 2016. It was the classic out of syllabus surprise question set by a tough paper setter aimed to fail cheating students, and given 10 min before the bell rings. Jigneshbhai was pretty excited about this new announcement and explained the various scenarios why it was a win-win situation for the government. Jigneshbhai was truly, genuinely excited today. Perhaps after a long time, there was satisfaction felt that being honest mattered, not having black money was good. And the silent black money holder was probably worried for the first time in years. But it was too early to celebrate. It definitely seemed like the first major step of many more steps of clampdown on domestic black economy. It seemed like an honest attempt, at the very least, and a genuine transformation, at the very best. The old man in the sprawling bungalow who had been listening to our conversation from the table next to us, reminded us that of all the calculated risks, this would probably rank way up there for this government, with potential gains outstripping possibility of losses – for itself and for the country. “To plant a garden is to believe in tomorrow” said Audrey Hepburn. I realized the truth in it over the past few months. A. Learn the rules, Experiment with what you can manage, and it starts working: Clearly there are a set of rules to learn to plant a garden, and it is important to learn them. Get good seeds, good soil and manure and water the plants are as basic as they can get. But the reality is that there are lots of experiments within this set of rules that are possible and can only be learned by doing. And that’s where your own decision on what type of plants, how many of them and how big a garden you can manage becomes important. Once you get through that and experiment with what you can manage within the overall realities of your life, it starts working. Very much like the rules of investing and how your own decision of what kind of investor you want to be will impact what works for you. B. Plants grow slowly but there is a funny pleasure in it: You can learn the process, get the seeds and plant them. After that there is not much to do but to watch them grow. And plants grow slowly. Everyday we went to the balcony to watch if there are any sprouts, and for a while nothing happens. There is a unique kind of fun in that too, in watching the plants grow slowly, and unless one learns to enjoy that, you will feel it is way too much trouble. The fruits or the vegetables aren’t going to be seen soon, and unless one enjoys the process more than the outcome, patience will likely get the better of you. Very much like long term intelligent investing where as Graham said you buy something using your process, and hope something good will happen. C. All types of plants and all seasons are important: Not all plants will grow with the same speed, nor will all of them grow in all seasons. There are seasons for planting, and there is a time for harvesting. Every single step in the growing process, every moment of those seasons must be respected. Nothing can be skipped. There are plants that will give vegetables every couple of weeks but then they run out after couple of harvests. And then there are plants that take a long time to bear its first fruit, but then will give you its fruit every season after that. Every type of plant and every season is important. Some plants and seasons are meant for producing great fruits. All others are meant for preparation. 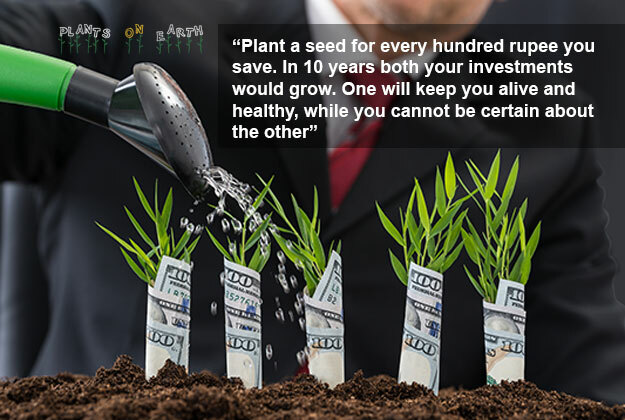 Very much like our own investing seasons and plants – where all types of assets and investments are important and bear fruit in different seasons. D. The final result may not be perfect but who cares: Some plants died midway due to weeds, perhaps due to more or less water, perhaps due to reasons I don’t know. And some plants have grown beyond our wildest imagination. In some cases, all sown seeds sprouted to life, and in some, none came up. As a whole, the garden produced a good variety of vegetables, which though not perfect are good enough for me. Finally I realized that that’s what matters – the result will most likely not be perfect but it doesn’t matter really as long as it is good enough for you. It is difficult to over-engineer outputs in gardening, specially for beginners unless you reach a level of sophistication perhaps. Very much like investing results – it is difficult to predict the future, and with all the bull and bear markets over a lifetime, it is impossible for the result to be perfect. But as long as it meets your purpose, who cares? E. You plant the seeds, provide the water and the soil, but someone else makes them grow: Now this is a philosophical one. I am sure there is a science to it which I don’t know yet. But despite the science to gardening, I am pretty sure everything is not being done only by the gardener. The gardener perhaps does the best possible to increase the probabilities of a fruitful result, but there are many factors that add up to create the result. You plant the seeds, lay the soil, water them and wait and watch with faith in tomorrow. And it is indeed a miracle that out of that sprouts a plant that not only springs to life and grows but has the ability to bear fruit. It is tough to predict which one will sprout to life, which will grow and which will bear fruit. Hence, leading to my hypothesis that like investing, you master the process to increase the odds, but perhaps someone else makes them grow.